Manchester United Football Club is an English professional soccer club that plays in the Premier League, the highest tier of English association football. Founded as Newton Heath LYR Football Club in 1878, the club changed its name to Manchester United in 1902 and moved to its current home, Old Trafford, in 1910. With a capacity of over 75,000, Old Trafford is the second-largest football stadium in the United Kingdom after Wembley Stadium, and the ninth-largest in Europe. In 1968, under the management of Sir Matt Busby, Manchester United became the first English football club to win the European Cup. This success came ten years after the 1958 Munich air disaster, which claimed the lives of eight players. The club’s most successful period came under Sir Alex Ferguson, who led the team to 28 major honors between November 1986 and May 2013. Louis van Gaal was appointed the club’s new manager in May 2014 after Ferguson’s successor, David Moyes, was sacked after just 10 months in charge. Louis van Gaal was sacked in May 2016 and was replaced a few days later by Jose Mourinho. Manchester United remain the most successful team in English domestic football, having won a total of 20 league titles, more than any other English club, as well as 12 FA Cups and 4 League Cups. Ryan Giggs, who briefly took over as United’s interim player-manager after the sacking of David Moyes, holds the all-time appearances record for the club. Giggs played a total of 963 matches between 1990 and 2014, almost 200 games more than the club’s second all-time leading goalscorer, Sir Bobby Charlton. The club’s record signing is Angel Di Maria, who arrived from Real Madrid for just under 60 million pounds in August 2014. Manchester United is one of the richest football clubs in the world, with its total revenue for the 2017 season estimated at over 750 million U.S. dollars. According to Forbes, it is also the second most valuable sports team brand worldwide as its brand value in 2018 stood at just 4.12 million U.S. dollars. This brand value is derived from calculating the portion of team's enterprise value that is not attributable to the size of demographics of its market, or league-shared revenue. In comparison, Brand Finance, which defines a club’s brand as the trademark and associated intellectual property, estimated Manchester United’s brand value at 1.9 billion U.S. dollars in 2018. After being floated on the London Stock Exchange in 1991, Manchester United was bought by Malcolm Glazer in May 2005, after which the company was taken private again. In August 2012, Manchester United made an initial public offering on the New York Stock Exchange, although companies owned by the Glazer family maintain control of the majority of the shares. 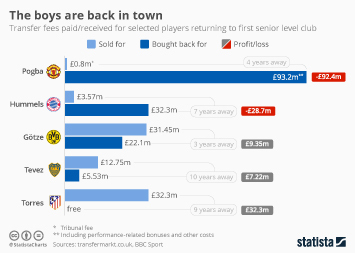 Manchester United remains one of the most widely supported football teams in the world and its recognition as a global brand has led to increasingly lucrative sponsorship deals. In 2017, the club’s total sponsorship revenue amounted to around 210 million U.S. dollars. This is, in part, thanks to a lucrative jersey sponsorship deal with Chevrolet which began in the 2014/15 season and will run through the end of the 2020/21 season. Annual fees from this agreement were 70 million U.S. dollars in the first season and will increase by an additional 2.1 percent each season thereafter. The club received a further 18.6 million U.S. dollars in pre-sponsorship support and exposure from 2012 to 2014, bringing the estimated total revenue from the shirt sponsorship agreement to almost 560 million U.S. dollars. In addition, it was announced that from the 2015/16 season, Adidas will take over from Nike as Manchester United’s shirt manufacturer as part of a world-record 10-year deal worth a minimum of 750 million pounds.